The feast of Corpus Domini (the Body of Christ) is one of the most spectacular events in Umbria and one I never miss. 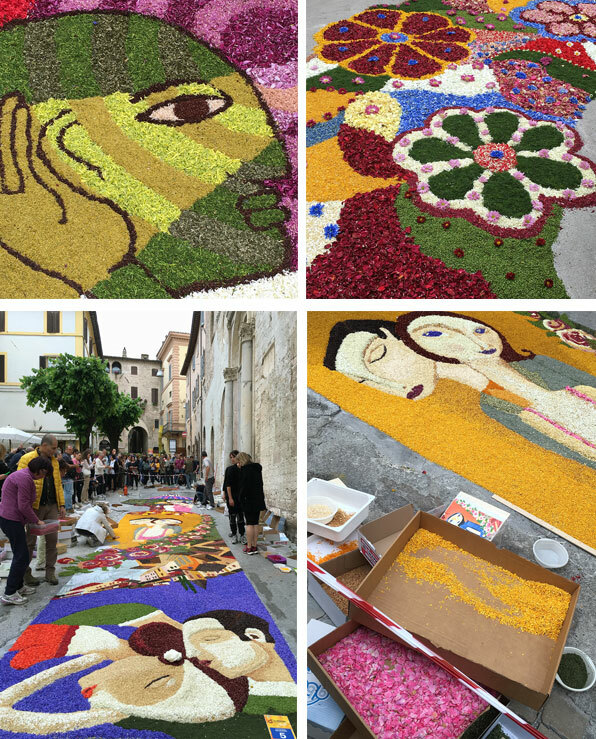 The normally peaceful town of Spello is transformed into wonderland of flowers like none other. The streets are literally carpeted with flower petals of every imaginable color both found in nature and dyed. Teams of workers — both social and church groups — work for months planning the event that each year celebrates the feast. The day before the feast, the groups layout their designs (line drawings on large paper sheets) in the center of major streets and, within their tarp-covered tunnels, work throughout the night creating the most elaborate designs. Some are purely geometrical and others are wonderful depictions of Biblical themes (think Noah’s Arc, doves, Popes, and Jesus in lots of positions. All are amazingly detailed and the result of an extraordinary amount of time and talent. I always go around 7am as the workers are uncovering their masterpieces and I am never disappointed. For me it is essential to be heading back to my car by 9am when everyone else in Umbria descends. It must be heart breaking to hang around for the mid-day pass after which the holy troop process down the major thoroughfare destroying the beautiful works of art. The symbolism is not lost. No matter how we endeavor to create things of lasting beauty, we all come to dust in the end. Humbling sentiments but a fantastic event. Come, spend some time discovering Umbria and witness the fantastic celebration.